Illustrated by Kerry Millard, Allen & Unwin, Australia, 2007, Knopf, USA 2008, Sweden, UK, Brazil, Taiwan, Italy, Portugal, Spain (Spanish, Catalan, Basque) Poland, Israel, Germany, Vietnam, Israel, Turkey, China. A sequel to the popular Nim’s Island (now a major film). When Selkie the sea lion is kidnapped, Nim has to leave her island paradise, stow away on board a cruise ship, and work out how to rescue Selkie and all the captive animals in the ship’s zoo. She also needs to reunite her family. Luckily she has Fred, her funny marine iguana, and two new ship-board friends, to help her. 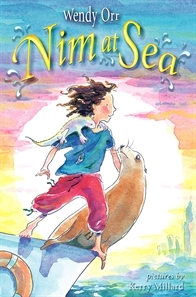 Nim lives on an island in the middle of the wide blue sea with her father Jack, a marine iguana called Fred, a sea lion called Selkie, and their new friend Alex Rover. Nim is as free as a bird, and she wouldn’t swap places with anyone. But when Alex flies away in the seaplane, without saying goodbye, and Selkie is captured by villains from a cruise ship, Nim must risk everything to bring them back. Her dangerous rescue mission takes her far across the ocean, to New York City. It’s a good thing she has Fred and two new friends by her side. I’d always wanted to write a sequel to Nim’s Island, because I loved being in her world so much that I wanted to visit it again, and I also wanted to know what happened next. But it wasn’t till I started working with Paula Mazur and Joe Kwong on the first draft of the screenplay, that I suddenly saw the story. The hours we spent discussing Alex and her phobias, and how she overcame them to cross the world for Nim, suddenly made it blindingly obvious that Nim now had to visit Alex’s world. Once I’d gone back to living in their world and they’d gone back to being real people for me, I also saw there were going to be problems as they worked out these new relationships. Some of the children who wrote to me asking for a sequel discussed how they thought Nim would feel once Alex was actually living there. I knew I had to explore that. Nim at Sea is dedicated to Paula because I really don’t think the book would have happened without her belief in Nim. In another twist, the artist, Kerry Millard’s own Nim at Sea dedication is to me – which of course I didn’t know till I saw it in the finished book – a strange, and very moving moment. In many ways, friendship is not only a theme of this book, it was one of the driving forces behind it.